Note: The GCA-6000 will coexist with most services such as Broadband, Satellite and FTTx, however, it is not recommended in environments where Cable Services (Internet/TV) are being used. 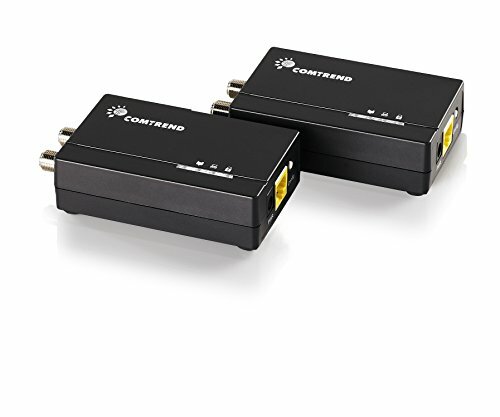 Comtrend's G.hn Ethernet over Coax Adapter is the first G.hn standards compliant Ethernet over Coax adapter. It allows users to extend a local area network via existing coax cables, and therefore provides an inexpensive option for a fast wired, Internet connection. Existing coaxial cables are already installed throughout many homes and businesses. When these existing coaxial cables are NOT being used for passing Cable TV/Cable Internet services, these coaxial cables provide a perfect physical medium to create a high performing Internet connection. The combination of low interference coaxial cabling plus the efficiency of the video-optimized G.hn standard enables the best real world Internet performance. The optimal solution in most cases would be a direct-wired Ethernet (RJ-45) connection. However, for most users, this is an expensive and troublesome option. Alternative technologies, including WiFi and WiFi Extenders offer connectivity but often continue to have connectivity issues. Using existing coaxial cables saves valuable service time, reduces truck rolls, and provides a network connection that is both higher performing and more secure than wireless technology.